The quickest and simplest way to let customers pay by card. The evolution of contactless payments in the last few years, has reminded business owners the importance of meeting the expectations of customers wishing to pay using a contactless card as their preferred method of payment. As with all of our debit card machines, our contactless card machines allow you to take payments quickly and efficiently. Where you see the contactless ‘wave and pay‘ sign displayed and the customer has a compatible contactless credit or debit card they can make a contactless payment where the amount is £30 or less. Anything above the £30 limit will have to be by the traditional Chip and PIN method. Contactless card payments are more convenient than other types of payment and eliminate queues which is pivotal if you’re in a busy retail setting. Wireless Terminal Solutions’ contactless card machines ensure it’s quicker and easier for your customers to pay. Our card processing terminals are designed to help significantly increase your sales and safeguard you against credit and debit card fraud. Our card processing terminals are designed to help significantly increase your sales and safeguard you against credit and debit card fraud. Pay quickly, efficiently and securely for your everyday essentials. With WTS’ contactless card terminals there is no need for a PIN or a signature – the customer just touches their card on a contactless card reader and the transaction is complete. Figures released in early 2016 confirmed there was a total of 86.5m contactless cards in the UK and the number of contactless transactions is increasing month on month. Our contactless card machines ensure it’s quicker and easier for your customers to pay. Our charge card terminals are designed to help significantly increase your sales, and safeguard you against credit and debit card fraud. So why are consumers willing to change the way they pay? The answer is speed and convenience. Consumers no longer want to fumble for change or worry about having enough cash for a purchase–they can simply place their contactless credit or debit card in close proximity to a payment terminal and go. Without the need for any lengthy paperwork, we can typically have a customer set up with a contactless card machine in a couple of days and you will have an account manager from start to finish to support you. Get an insight into all of our handheld credit card machines and head over to the card machines page for more info. Keep your credit card machine costs down by opting for a long term card terminal rental. We have attractive prices to suit your requirement. Mention ‘long term payment card terminal lease’ when speaking with a representative and take advantage of great savings today. Is there a purchase limit for contactless purchases? My card machine is Contactless enabled, do all customers have to use it? How do I know whether a customer's card is Contactless enabled? Will I get a receipt for my Contactless transaction? How close does a customer's card need to be to the reader? Can I use a Contactless card to get cashback when making a purchase? Could I unknowingly make a Contactless purchase as I walk past a Contactless handset? Is there any chance that a Contactless payment could be taken twice from my account? My current card machine isn't Contactless enabled, How can I start accepting Contactless payments? Contactless payments are a fast alternative to the traditional Chip and PIN offering customers an easy and secure way to pay. It currently stands at £30 or under. Contactless technology is an additional feature on customers’ cards. Not everyone has it, and it is entirely up to the customer’s discretion. You will see a symbol on the card that can be described as having 4 small waves on it. If you see this, it means the card comes Contactless enabled. The underlying technology for all of these devices is the same. The Contactless card terminal contains an antenna so that when it is touched against a contactless handset, it securely transmits purchase information. If you would like a receipt to confirm the contactless transaction, speak to the merchant when you pay. We recommend that you touch the card to the reader, and take the card out of your purse or wallet before you use it. No, this is not possible. The customer will need to use their PIN for these transactions. Yes it is. The Contactless technology uses secure encryption (the same as a Chip and PIN transaction). For added protection, from time to time, you may be asked to enter your PIN to verify you are the genuine card holder. No you can’t. The merchant must have entered the sale amount for you to approve first, and then your debit card has to be held within a few centimetres of the charge terminal for no longer than half a second. No. Contactless card readers are only able to make one transaction at any time. As a safeguard, each transaction must be complete or void before another can take place. 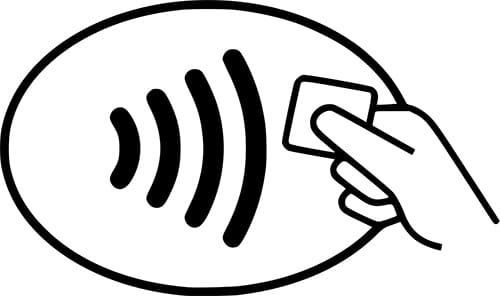 Please contact Wireless Terminal Solutions and we will be able to provide a Contactless card terminal.